For decades organizations marketed their events in print advertising—mostly in trade journals—or through word of mouth, processing the resulting registrations by fax or business reply card. Then email and the Web came along and revolutionized the way events were marketed, but new technologies and changing behaviors are again driving new methods of acquiring audiences. This article, which is a first in a series of audience acquisition resources, explores the top 8 ways the most savvy marketers will be getting high-value attendees to their events in 2019 and beyond. It is not likely that email is going away anytime soon, especially given its direct link to online registration. However, you are likely to see it employed in ways that go beyond the traditional save-the-date or early-bird promotional offer to include new marketing channels. The most impactful of these channels will be influencers, especially as target audiences skew toward millennials who value authenticity over hype. In fact, according to recent research, 90% of millennials say authenticity is important to them when deciding which brands to support. [i] So, it makes sense to invest in ways of engaging and tapping into the built-in trust of your influencers. Creating the ability for influencers to share email or social content with their network greatly expands your reach through authentic word of mouth. Working with speakers and partners is another way you can amplify your message to get the word out about your event while enhancing the value of what you’re offering. Think about how popular Adidas shoes are and how much more popular—coveted even—Adidas Yeezy’s are because they’re a collaboration with rap artist, producer and fashion designer Kanye West. Negotiate co-marketing activities with luminary speakers upfront in the contract phase and then drive the messaging throughout the audience acquisition phase. Approach your partnership relationships in a similar fashion, focusing more on what you can offer together than how much revenue the sponsorship might bring you. 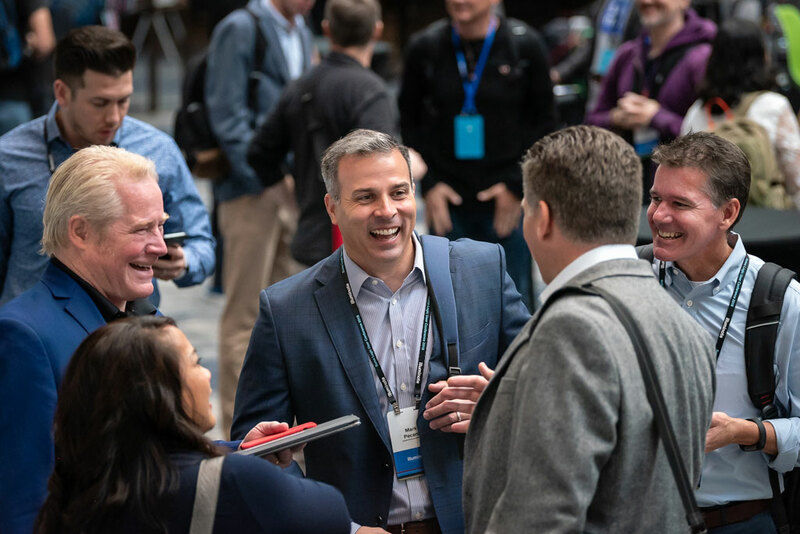 A well-considered, co-branded approach will elevate the overall attendee experience while creating a more strategic and rewarding relationship with your partners. Elevate the partnership from branded water bottles to co-presented demos that show off the full capabilities of your joint offering, and preview that in your acquisition efforts. Don’t forget the influencers and enthusiasts in your own backyard—your employees. Creating a comprehensive internal communications plan should be an essential part of any audience acquisition strategy. After all, who knows your products and your clients better than your employees? It’s also an excellent way of including employees who may not be directly involved with the event. Use everything from internal messaging toolkits and sales contests to social sharing tools in order to help amplify your message. Borrowing from the cool factor of popular events like SXSW and TED, an increasing number of B2B companies are getting in on the experiential action. In fact, a recent study from Bizzabo showed that B2B events account for $512 billion in annual spend! That means there’s more competition than ever for your prospective attendees’ time and money. So, when prospective attendees perform a Google search on “best B2B conference of 2019,” or “best cybersecurity conference of 2019,” or “best [insert keyword here] of 2019” you want to be sure your event appears within the first 10 organic results. Why? Research shows that 70–80% of search engine users only focus on the organic results. [ii] But it’s not just your event website that you want people to find. Ultimately, you also want to be included on the wide variety of articles that list must-attend events, which means you’ll need to identify those lists and follow-up with the authors about including your event. There’s another reason that SEO is important—customer experience. If your event website is your primary conversion platform for registration (and it likely is), then you want to make it as easy possible for prospective attendees to find your site. Studies have shown that even if people know the URL and can access it directly, they often perform a google search to navigate to a site instead. For example, reviewing the site traffic data during the six months leading up to the annual Consumer Electronics Show (CES) this year, organic search traffic is by far the leading source of traffic (47%) to the site, followed by direct traffic (34%). This is a trend that we see regularly, and a behavior you likely partake in as well. Retargeting is a form of marketing where advertisers target consumers based on their previous internet actions. There are various types of retargeting available today, but the most effective for events are email retargeting and event retargeting ads. Email retargeting can be especially useful in converting prospective attendees who have begun the registration process but not completed it. There can be many reasons a prospect abandons their registration, including a distraction such as a phone call or meeting, or a barrier such as a costly registration fee. Depending on where and when the registration was abandoned, you can email the prospect with personalized messaging that will help convert them to becoming a registrant. With event retargeting ads, you can capitalize on the prospect’s interest by displaying a Twitter ad featuring a luminary speaker after they visit your event website. Or you might want to display an ad with a discounted registration fee or other promotional offer to help drive conversions. With more and more events to choose from, how do you make your event stand out from the crowd? One way is to create a fear of missing out (FOMO), and the surest way to do that is to generate a feeling of exclusivity. Whenever there’s a chance that one might not be able to participate in something that is happening, it creates FOMO. This can be achieved through clever messaging that employs language such as “invite-only,” “limited-space,” “apply to attend,” or “only 20 seats remain” that creates a level of exclusiveness to make people feel special when they secure their spot. The trick to being successful with the FOMO approach is that your event absolutely must deliver on the promise it makes of being extraordinary. You can also combine this approach with segmenting and attracting VIPs or C-level audiences. By creating exclusive perks and content for a smaller subset of your audience, you can test to see what works and then build upon that. According to the Decision to Attend Phase 2 (DTA2) Study from IAEE, in 2017 the top three drivers for attending an event were education (92%), destination (78%) and networking (76%) and have consistently been the top three drivers since 2014. For shorter (half day or less) events, proximity and ease of accessing the destination are likely to be the most important factors to highlight. However, for multi-day events, it can be beneficial to play up the destination. You may even consider partnering with local businesses to offer discounts or special tours that entice attendees to extend their trip. The advantage is twofold: It creates a richer, more memorable attendee experience, but it also creates a deeper investment in the trip for the attendee, making it less likely that they will cancel at the last minute. At the end of the day, attendees are looking to come away from your event feeling like they’ve learned something, experienced something completely different, and made valuable, new contacts. Not only must you deliver on all of this, you also have to articulate and share the feeling before it ever happens so you can get the right audience there in the first place. It’s important to work closely with event strategists to ensure cohesive messaging and attendee journey. Each point in the journey should feel like it is building on the last, making it richer and more engaging. This requires a keen understanding of your target audiences, the event strategies, the content and messaging, and your overall business goals. Our experienced InVision team can help you incorporate these tactics into a comprehensive audience acquisition and engagement strategy that will meet your business goals. In fact, we’ll even help you define the KPIs that will ensure long-term success. Email us at info@iv.com for more information or visit our website at www.iv.com. This entry was posted in Audience Acquisition and tagged audience acquisition, B2B, event marketers, events, experience, influencers, InVision, IVC, marketers, marketing, retargeting, search engine optimization, SEO. Bookmark the permalink.